Easter Cracked – it’s a record! 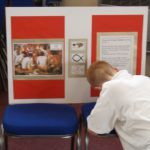 This year 40 schools have booked an Easter Cracked session with their local church(es), in conjunction with Bridgebuilder. This means 2,198 primary aged children in Years 5 or 6 will experience this interactive fun project – the highest number since Christmas and Easter Cracked began in MK! Easter Cracked tells the Easter story through different media, and includes a variety of activities including an Easter craft (making a palm cross)…and a Cadbury’s cream egg for all who attend! You can see the list of schools which have booked Easter Cracked and the hosting churches who deliver the project here.